I headed to the hotel with Jeanne to meet my future sister and brother-in-law and their four year old son, Tom. They had flown in from the East Coast for our wedding on the Saturday. Since it was my first time meeting them, my mouth felt sawdust dry with nervousness. So, I popped in a stick of Bazooka bubblegum and relished its wonderful ooey, gooey, juicy, flavorful experience. Shortly after arriving at the hotel, four year old Tom and I were left alone in the adjoining suite while Jeanne helped her sister and husband put together a tray of appetizers and drinks in the other room. It didn’t take much to realize this little tyke would be a challenge to entertain. I decided to blow up the largest bumble I could. Giggling, he looked on with delight as the bubblegum expanded. Then, the little brat punctured it with his index finger. The icky, sticky bubblegum splattered like some ghost vomited pink slime on my well coiffed facial hair. 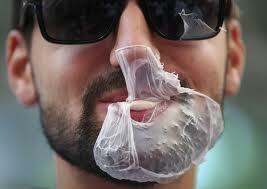 The rest of that evening was spent attempting to expunge that damn, lousy bubblegum from my beard. Saturday morning, I gave up and sadly shaved off my beard and moustache. This entry was posted in Writing Prompts and tagged B. B. Wright, bubblegum, Write on Edge. Bookmark the permalink.